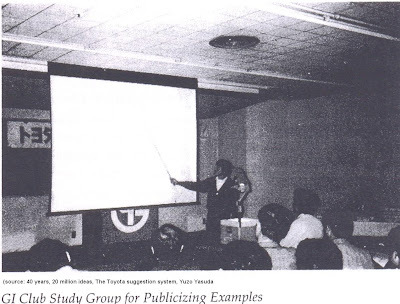 “Good Idea” (GI) club was established in 1972 when six gold medal winners of Toyota’s idea management system began to meet regularly. What started as just a place for like-minded people to meet soon expanded in scope to exchange creative ideas and give talks. Here is a story of Takao Umezu from Kamigo factory’s second machining division on how his manager got him interested in giving ideas (adapted from the story in 40 years, 20 million ideas by Yuzo Yasuda). “Just a minute, Mr. Umezu, Do you have any free time later on today? If you don’t mind, I’d like to see you about something”. This is what my foreman said to me one day as I was getting ready to go home. I hoped it would be a restaurant or yakitori shop. Unfortunately, it turned out to be a hall with sign that read, “Second Toyota GI club example exchange meeting”. I was disappointed. I was in for a surprise when I looked at the front where presenters were seated. One of the presenters was one year junior to me in my high school. When it was my friend’s turn to speak, my heart began to beat faster, just as though I were the one giving the talk. I was surprised again. The content of his improvement, the charts he used and the delivery were excellent. I felt it would be great to be able to implement the kind of change he had talked about. From then on, I started walking around my workplace, searching intently for anything that might be an opportunity for improvement. Unfortunately, not even a single idea occurred to me. Then one day, my foreman came over to me and scolded me in a loud voice: “Hey, is that work hard to do?” To tell the truth, it really was. But I had simply gotten used to the fact that it was hard to do. Was that a hint for me to suggest an idea? On the following day, I suggested to my foreman that if a certain kind of tool were used, the work would become easier to do, and he made the arrangement for it right away. Things improved, but before I could relax, my foreman said to me, “By the way, have you filled out the suggestion form?” I didn’t know how to fill it out, so I spent all night working on it. When I gave it to my foreman the next morning, he said, “Oh, this is good. You’ve really done a good job writing this up.” Because of his words, I was no longer apprehensive. The award I received was only $5, but it made me extremely happy. A few days later, as I was continuing to make several improvements, I ran into a problem that my idea alone could not solve. So I consulted my foreman. He said, “Umezu, this problem has deep roots, but it looks as though it is worth tackling. If it can be solved, it would result in making great improvement.” After implementing the improvement and verifying the results, I quickly filled out the suggestion form. But my foreman’s reaction was unfavorable. He said, “Unless the quality of the form corresponds to the suggestion content, people on the screening committee will not understand it well and your idea won’t be rated well. What about the current situation? What was causing the trouble? What methods should be used? How much will it cost? What about benefits? Can you show how much money will be saved?” The prize I received $40 for this idea was a lot more that I had expected.